So you need to figure out the year of production for your Fender guitar or bass. You're not alone. Fenders rank as the most frequently bought and sold instruments on Reverb, and finding a precise date of manufacture can be key to determining the value and specifics of an instrument. The most important thing to keep in mind when dating a Fender is the highly modular nature of the designs. Like Henry Ford, part of Leo Fender's genius was in optimizing the company's production efficiency. His guitars were built en masse by an entire factory, not a single luthier toiling over one instrument at a time. Features like bolt-on necks and pickups wired into the pickguard all helped the Fender factory churn out guitar after guitar, day after day. This also means that various parts used on a particular guitar may have come from different points in time, so no single number can absolutely define when the instrument was built. 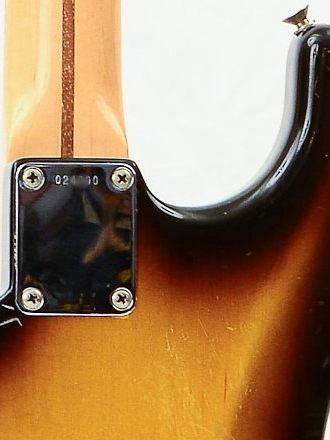 Instead, the best approach to dating a Fender is to combine indicators from the design of the instrument, the dates found on the neck and body, along with the serial number. Once you have the information you need, if you're interested in selling your Fender, you can use Reverb to get it in front of the largest audience of musicians in the world by clicking on this link. Perhaps the best place to start when dating your Fender is to get an approximate idea of the era based on the instrument's design and components. This can be a tall order for someone less versed in guitar history, but we do have some resources here on Reverb to help you out. For starters, there's the Reverb Price Guide which has thousands of entries with pictures and details on various guitars and other gear. Some browsing around the Fender section of the Price Guide can definitely help you find which model you have. We also have some other blog posts related to Fender that can hopefully be of some help. There's A Brief History of the Stratocaster Part I and Part II that follows the evolution of the most popular Fender guitar of all. Similarly, take a look at Behold the Jazzmaster for general timeline of the history of everyone's favorite offset guitar. For Fender during the turning point era of the mid-'60s, check out Fender and the CBS Takeover. Through much of Fender's production history, Fender workers would print or write a production date on both bodies and necks where the two pieces meet. These dates will tell when the original part was manufactured, but are not exact indicators of when the guitar was actually put together and finished. If you're not comfortable removing the neck of a guitar to peek at the date marker, I encourage you to take it to a local tech or luthier. I will also mention briefly pot-codes as a resource (numbers on the internal potentiometers of the guitar). These can definitely be useful in cases where no other numbers exist, but just tell when the pot itself was made. 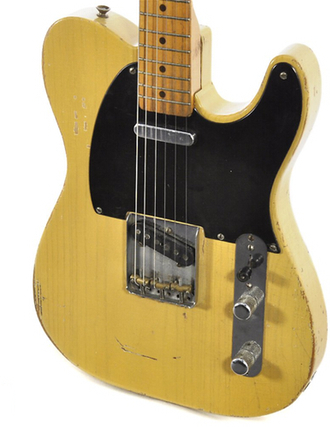 Who knows how long it was waiting in the Fender factory before finding its way into a Tele? 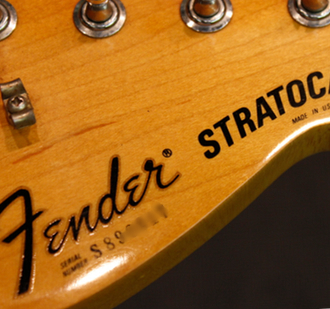 Like the body and neck dates, using serial numbers to date a Fender is not a sure bet. At many points in Fender's history, serial number usage overlapped again owing to the modular manner of production. Below we'll go into detail about the various serial number schemes employed by Fender as far back as 1950. There are certainly plenty of exceptions, so again, using serial numbers in conjunction with other dating methods is always the best bet. Four digit serial number on the bridge, 1950 - 1954. Four or five digit serial number on the neck plate with no letters, 1954 - 1963. Serial number on neckplate starts with an L, 1963 - 1965. Big F on the neckplate with a six digit serial, 1965 - 1976. Serial number starts with a letter followed by six or seven digits, 1976 - present. Made in Japan serial numbers. Made in Mexico serial numbers. 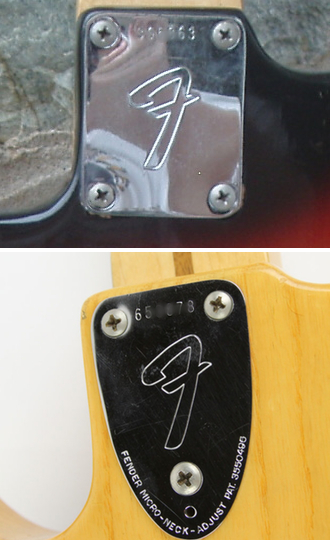 In the early years, Fender serial numbers schemes were specific to the model. Esquires, Broadcasters and Telecasters shared a serial number sequence, while the landmark Precision Bass had its own system. In this early period, the serial number can be found on the bridge of the instrument (see image). Also, for the first half or so of 1954, the inaugural run of Stratocasters had a distinct number sequence all under number 6000. By mid-1954, Fender began using a universal serial number sequence for all its instruments. At this time, the location of the serial number also shifted from the bridge to the neckplate (the metal plate located on back of where the neck meets the body). 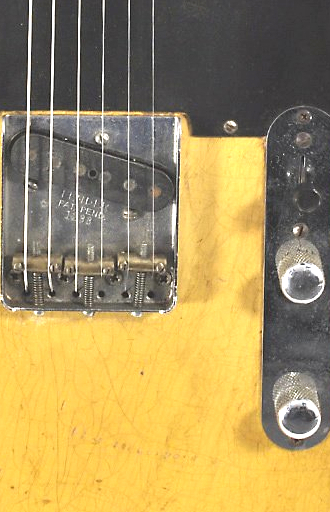 At the very end of 1962 and into 1963, Fender changed to a system where serial numbers began with an "L." According to some accounts, the L was supposed to just be a 1 to mark the cross over into the 100,000 range from the previous scheme, but an L was used by mistake. After the CBS purchase of Fender in 1965, the factory switched to a new serial sequence with numbers that continued the same general format used prior to the takeover. These are generally referred to as F series due the large Fender branded F on the neckplates of the era. This period also saw a switch from the orginal four-bolt neckplate of the '60s to a three-bolt neckplate in just one example of cost-saving costs introduced under CBS. Starting in 1976, Fender transitioned to a new serial number scheme and moved the placement of most serial numbers to the headstock of the instrument. Depending on the era and model, the number can be found on either the front or back of the headstock. After a short period of overlap with the old system, the post-76 numbers will start with a letter that indicates the decade, followed by a number that indicates the year of that decade. The decade letter codes break down like this: S = 1970s, E = 1980s, N = 1990s, Z = 2000s. In the 2000s, you'll also see serials starting with a DZ which indicates the Deluxe series, but the format is otherwise the same. For example, a serial number with N4 would be from 1994. One starting with Z5 would be from 2005. This scheme is not 100% consistent due to a number of production factors, such as Fender producing more serialized decals than needed in a given year. This is particularly pronounced in the transitional period of the mid-'80s, though the system has been pretty much on point since about 1990. After 2009, the letter changed to a format starting with US then two digits that tell the year of the current decade. American-made signature series instruments follow a very similar scheme to the above, but use a prefix S before the decade letter. For example, a Signature Series guitar from 1998 would have a serial starting with SN8 followed by five digits. The major exception to all of this is the American Vintage Reissue (AVRI) series. These have serial numbers starting with V and do not strictly correlate to years. The neck dates on these guitars, however, are usually reliable. 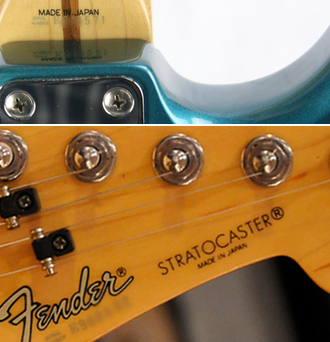 Fender Japan serial numbers can usually be found on the back of the neck near the neck joint. Though examples also exist with the number on the headstock or the neck-plate in the case of certain early reissue models. Up until 1997, the serial was paired with the words "Made in Japan." In 1982, Fender expanded operations with a series of instruments produced in Japan by the Fuji Gen Gakki company. Like the US serial numbers, MIJ (made in Japan) serials start with a letter or pair of letters that indicate the rough year of production. This system, however, is notoriously inconsistent and incomplete, which makes dating by serial number even less reliable for MIJ Fenders. 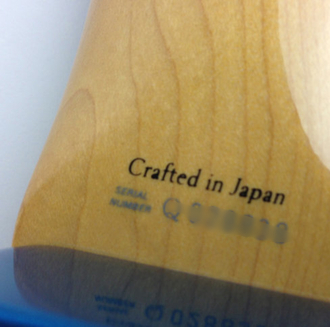 In 1997, Fender changed the "Made in Japan" decal to say "Crafted in Japan." There is some overlap with the earlier "MIJ" serials, so it's important to note if your instrument carries the "Made in Japan" or "Crafted in Japan" decal. After 2007, Fender Japan switched back to marking Fenders as "Made in Japan" though for a few years instruments with both decals were made. Serial numbers since this transition have continued the same sequence as the "CIJ" era. Fender opened a factory in Ensenada, Mexico in the late '80s and instruments started coming off the line in 1990. 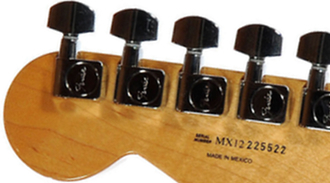 Mexican-made (MIM) Fenders carry a serial number on the headstock starting with an M. Some exceptions include a handful of special editions and signature models as well as the split US/Mexican-made California series which all have a "AMXN" at the beginning of their serials. The MIM serial number scheme is actually very straight-forward. For Mexican Fenders made in the 1990s, the serial will start with an MN followed by a number that indicates the year of the decade. Instruments made in the 2000s follow the same form but start with MZ. For the 2010s, the prefix is MX1. For example, a serial number starting with MN2 would be 1992. There are a number of exceptions to all these serial number schemes. As mentioned above, many reissue models use serial numbers that don't really correlate to their age. Additionally, there have been plenty of artist models, limited editions and other rare models that use a unique serial number. Examples include the 35th anniversary series, many of the uniquely finished Strats from the early '80s, as well as various export-specific models which carry a serial number starting with FN. Again, the serial number alone in any of these cases is not definitive and the best approach is to combine that with other methods like the neck and body dates, as well as just the features of the specific instrument. If you have any questions as to what Fender you're dealing with, I encourage you to seek out a local guitar shop or luthier to help figure it out.